Boredom Breaker Naturals Herbal Garden provides your small furry friend with a delightfully healthy mix of tasty, aromatic herbs including green oat, balm, peppermint, nettle and camomile. This delicious herbal mix provides animals with essential roughage, vitamins and minerals and offers a great supplement to a well-balanced diet. 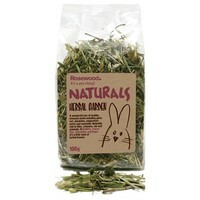 Rabbits, guinea pigs and chinchillas simply adore this little taste of herbal paradise. This mix is very popular with my guinea pigs and helps to keep them occupied. The price is great too.